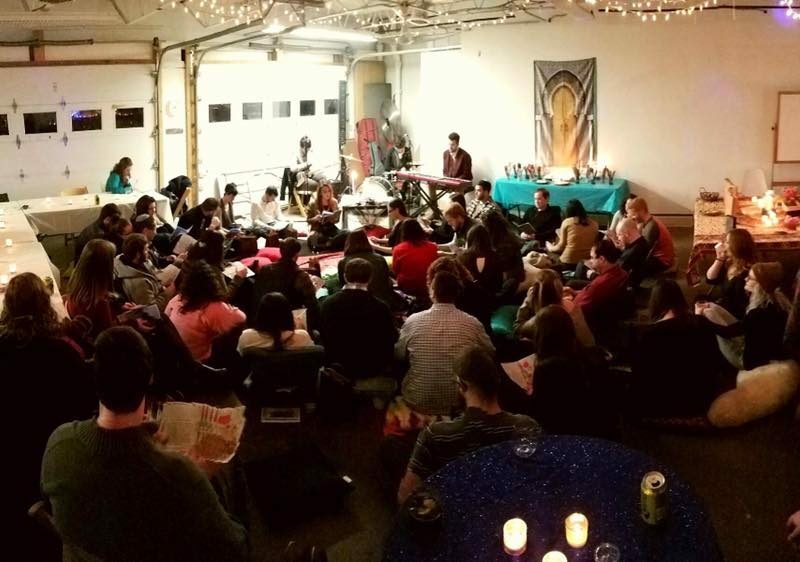 Six Points Collective’s “5 Senses” Havdalah service held in the ArtWorks Garage. Are you a young adult looking for a nuanced spiritual Jewish experience? Perhaps one that involves incense, doesn’t require shoes, and makes you feel like Penny Lane from Almost Famous? Look no further because Six Points Collective is here to bring you just that, with their unique six-part spirituality series, courtesy of one JFC Jewish Innovation Fund winner, Lizzie Birckhead. (Have your own idea that could transform Cincinnati? We are currently taking applications for this year’s innovation grants at jewishcincinnati.org/innovation). Everyone searches for meaning in a different way. Many attend synagogue and feel a sense of enlightenment when listening to a sermon by their favorite rabbi. Some feel it when running outside on a cool day or even by meditating to the “Dreamy Vibes” Spotify playlist a friend recommended. Whatever your method, the Six Points Collective provides another opportunity for spiritual connection you’d be pleased to add in your life. The second installment of the six-part series took form this time as a “5 Senses” Havdalah observance where about fifty young Jews gathered in the ArtWorks Garage to lounge on colorful cushions, enjoy live music, share thoughts and memories with friends, and much more. Lizzie’s down to earth vibe was perfect for leading an inclusive service that left the crowd feeling relaxed, mindful, and all around happier than they came. The ceremony was flawlessly topped off by a group singing of Joni Mitchell’s “Big Yellow Taxi” which acted as a perfect transition into the rest of the night’s festivities— and boy, was it amazing. In a successful effort to cover all sensory bases, the Six Points team scattered five separate stations around the room, each devoted to one sense. For smell: make/take home your own incense bundle, touch: silly putty and endless bins of beads perfect for the submerging of both hands, bringing us promptly back to the 3rd grade, sound: create a personal sticker and sparkle-decorated shaker, sight: multicolored light fixtures and kaleidoscopes galore, and for taste: a “guess this wine type” quiz (I failed). Other sensational (pun intended) aspects of the evening included a terrific live band, a scrumptious buffet of homemade Moroccan food, and an open bar. All of the most wonderful tools for making the heart full. The Six Points Collective’s Havdalah vision made for a truly magical night that left me feeling light and inspired for days to come. I certainly look forward to seeing what Six Points brings us next. So…I guess you could say that I liked this event.